A neighborhood in Aguilar (Google Maps). 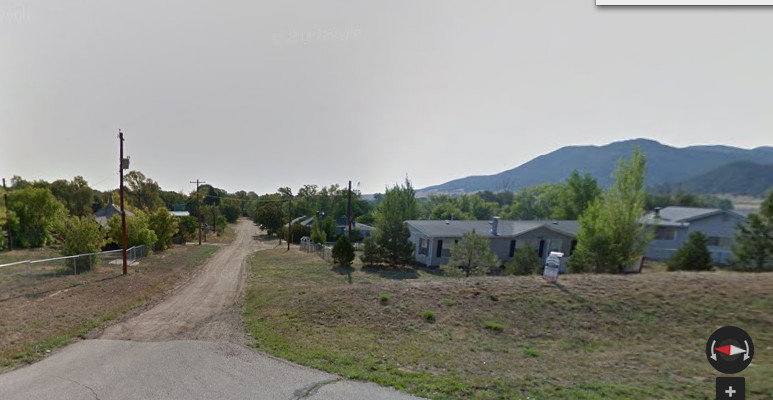 I do not know where Bear 839 (her ear-tag number) was born or when—maybe in 2011—but on August 24, 2013, she entered a open residential garage in the tiny town of Aguilar, in southern Colorado. Bear(s) came to freezers in open garage, no doors. Destroyed two chest freezers and contents. RP [reporting party] tried to run off by throwing rocks, etc. He made the usual recommendations: close and latch windows and doors. Maybe use some electric fencing or an electric-shock "welcome mat" to discourage prowling bears. Whatever the homeowner did or did not do, 839 came back. Next step, the culvert trap — a large metal tube mounted on a utility trailer frame. Some bait attracts the bear to climb in, moving the bait triggers the door to slam shut, and the DWM hooks up the trailer to a pickup truck and drives away. Now she was a "problem bear." Trapped, she received an injection of Telazol (Tiletamine) at 11:07 a.m. on August 26 and within two minutes was comatose. She was recorded as a subadult female, breeding status "unknown/not applicable." While she was out, her lip was tattooed ("4838") and she got two yellow plastic ear tags ("839"). And she got to ride in her culvert trap into some forested, canyon-cut land west of Trinidad, where she was released. From the release site to my house is 75 miles if you are an airplane, no doubt much longer if you are a bear. By May 2014 she was here. What drove her to travel north, ever north? Certainly the DWM left her in what he considered to be good bear habitat. He was trying to give her another chance. She might be the bear in a scout camera picture taken May 20th, but by the end of May she was dead — shot, I am convinced, by the man whom I refer to here as "Mr. Tactical." That investigation and the two that go with it are not yet over. I raised a little commotion with Colorado Parks and Wildlife, and now I am getting phone calls from middle management. When I have more to say, I will. But don't hope for satisfying justice. How Do You "Prep" for a Solar Storm? All My Flycatchers, Season 10: Fly or Die!